Experience the art de vivre at a Nanjing luxury hotel blending Chinese elegant design and a French touch. Sofitel Nanjing Galaxy rises over the city in a 48-storey tower located in the heart of the business and entertainment district. 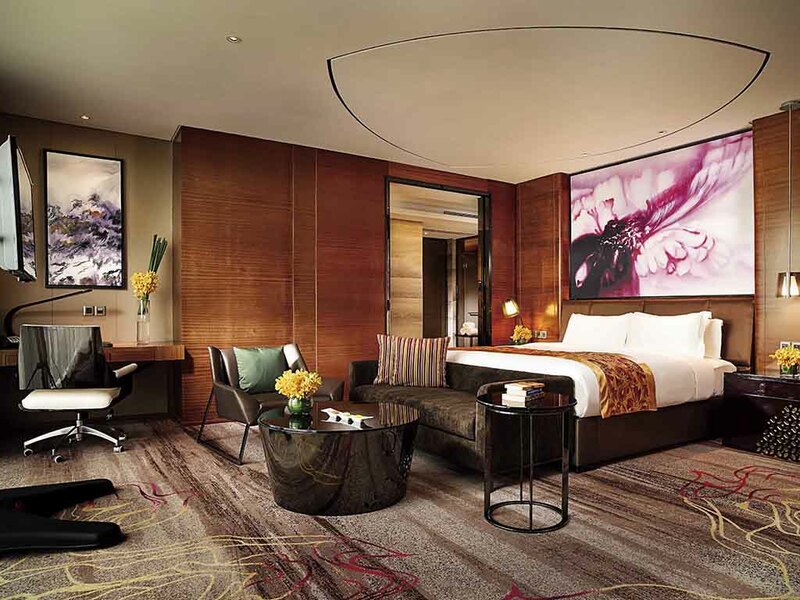 Year after year Sofitel Nanjing Galaxy Suning garners an impressive array of awards earning praise for its sensational restaurants Sofitel Butler service meeting and event facilities hospitality and overall experience. Each Sofitel is a unique blend of the French art de vivre and local refinement. At Sofitel Nanjing Galaxy Suning, blue and golden accents blend harmoniously with a soothing color palette, imbuing your stay with a sophisticated touch of luxury. While away the afternoon in the hotel's art gallery. Marrying old with new, it showcases an impressive collection of timeless Chinese masterpieces alongside modern photographic exhibits by upcoming young artists. From the airport take the expressway to the Shuangqisomen overpass. Turn left onto the Saihongqiao overpass and then right onto Fengtai Road. Straight ahead until you reach Caochanmen, then turn right into West Beijing Road. 2 km further, turn left into Yunan Road and then left again into North Zhongshan Road. Continue for 1 km until you reach the hotel. Approx. 45 minutes from the airport to the hotel. 268 beautifully designed rooms and suites all 36 square meters or bigger. All rooms are equipped with plasma TV, free plug-and-play broadband and a safety box large enough to store a laptop computer. The height of style. 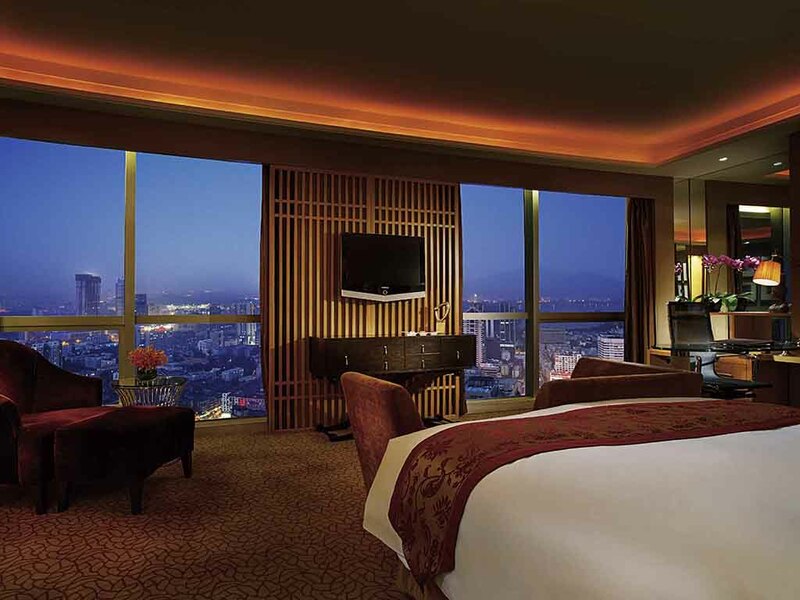 Enjoy views at the top of the city and high-end design in the luxury hotel suites of Sofitel Nanjing Galaxy Suning. 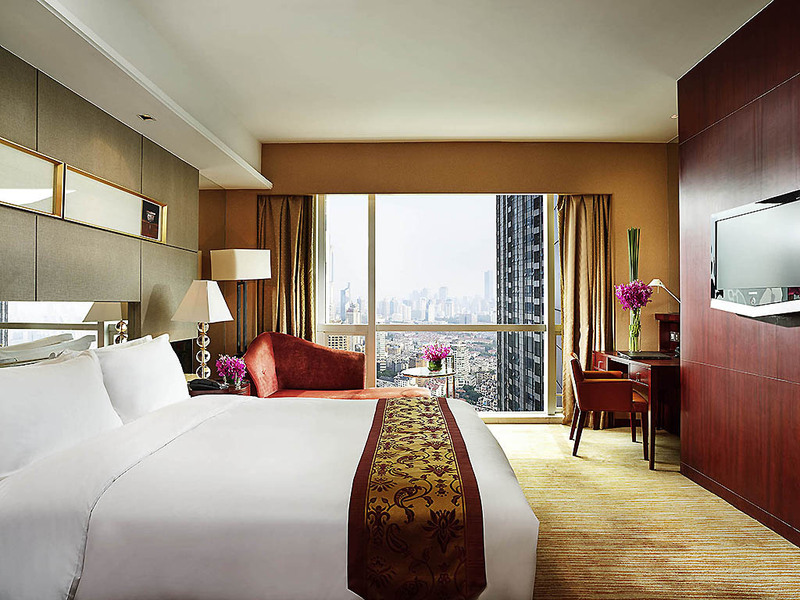 A luxe bathroom plush bedroom and spacious living room with views of the city await guests in each exquisite suite. 37 m², 400 sq. ft., plasma screen TV, free high-speed Internet access, bathroom with rain-style shower, rollaway bed allowed. 37-51 sqm, 400-550 sqf, plasma screen TV, free high-speed Internet access, bathroom with rain-style shower, rollaway bed allowed. 57 sqm, 615 sqf, plasma screen TV, free high-speed Internet access, bathroom with rain-style shower, rollaway bed allowed. 58 SQM / 624 SQFT, Sofitel MyBed, 48" TV with satellite channels, Shower, Lanvin bath amenities, Complimentary Wi-Fi, 1 Extra Bed & non-smoking rooms available upon request. 37 m², 400 sq. ft., plasma screen TV, free high-speed Internet access, bathroom with rain-style shower, Club Lounge access, rollaway bed allowed. 57 sqm, 615 sqf, plasma screen TV, free high-speed Internet access, bathroom with rain-style shower, Club Lounge access, rollaway bed allowed. 58 sqm, 625 sqf, plasma screen TV, free high-speed Internet access, bathroom with rain-style shower, Club Lounge access, rollaway bed allowed, city views. 69 sqm, 740 sqf, plasma screen TV, free high-speed Internet access, bathroom with rain-style shower, Club Lounge access, separate living room, city views, rollaway bed allowed. 69 m²/740 sq.ft., plasma screen TV, free high-speed Internet access, bathroom with rain-style shower, Club Lounge access, separate living room, city views, rollaway bed allowed, exercise bicycle, yoga mat and yoga ball. 125 m²/1,341 sq.ft., plasma screen TV, free high-speed Internet access, bathroom with rain-style shower, Club Lounge access, separate living room, city views, rollaway bed allowed. 120 m²/1,288 sq.ft., plasma screen TV, free high-speed Internet access, bathroom with rain-style shower, equipped with comprehensive kitchenware including refrigerator, washing machine and cooker, separate living room, city views, rollaway bed allowed. Executive floor and suite guests enjoy a variety of VIP privileges including access to the Club Millesime lounge with its impressive wine showcase a signature of each Club Millesime in Sofitels worldwide. Club guests enjoy complimentary breakfasts evening happy hours all-day tea coffee and soft drinks and a portfolio of exclusive services and benefits. If you prefer to dine in the comfort and privacy of your room, our world-class chefs are a phone call away. You can truly indulge with our low-calorie De-Light menu, and savor an array of refined French and local culinary specialties at any time of day. Sofitel Nanjing Galaxy Suning's award-winning restaurants are at your choice for spectacular dining experiences - from the sumptuous breakfast and buffet at Kwee-Zeen, the Chinese delicacies at Le Chinois and the Italian style of Bistecca restaurant. Relax amidst elegance in Sofitel Nanjing Galaxy Suning's bars. Overlook the city in the shimmering surrounds of Le Bar. Savour your favourite drink. A relaxing venue to enjoy, relax, drink or meet. It offers afternoon tea, happy hours and late night party providing extensive beverage selections and attractive tapas. Freshly baked bread and pastry for your takeaway. Enjoying diversified breakfast in a leisurely atmosphere gives guests a good mood all day long. Drink a cup of warm fragrant tea or coffee, and enjoy diversified breakfast in a leisurely atmosphere, giving guests a good mood all day long. Le Chinois Restaurant located on the 7th floor with Chinese style decoration. It offers Huai Yang and Nanjing local cuisines mixed with a selection of creative courses with an emphasis on the ingredients to ensure the freshness and originality. up to 540 people for a sit-down dinner. Meanwhile 2 Chinese VIP chambers offer local character with tea tables and sofas for intimate gatherings. WiFi internet access and state of the art audio-visual technology are on hand in each meeting and event venue. Your wedding story unfolds at Sofitel Nanjing Galaxy Suning with a pristine setting ultimate luxury gracious service and touch of French romance. Explore the options for a spectacular Nanjing wedding celebration in Sofitel style. Elegance, indulgence and inspiring city views. Sofitel Galaxy Nanjing accommodates wedding participants and guests in 278 luxurious rooms and suites, complete with panoramas of the city and signature Sofitel style. Celebrate your day with culinary artistry and a wealth of delicacies. Choose traditional or contemporary; Chinese wedding favourites or French gourmet creations. Toast to your love with the finest champagnes and the sommelier's pairings of wines. Sofitel Galaxy Nanjing boasts an array of event venues. The most popular selection for weddings is the immaculately designed 864 sqm pillarless Diamond Ballroom, seating up to 540 guests for banquet-style wedding receptions. Sofitel Galaxy Nanjing's InspiredWedding Planner is your guide and partner in creating a wedding to remember forever. Your planner brings imagination, expertise and dedication to shaping and managing your special day and all of its preparations. 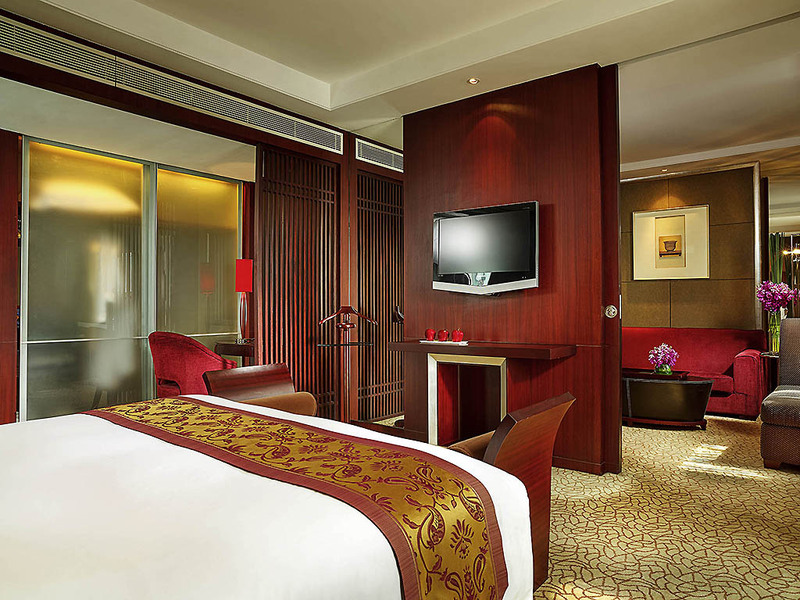 The hotel is located in the heart of Nanjing's Gulou District at the crossing of Shanxi and Hunan Roads. It is conveniently accessible for wedding visitors, situated 45 minutes from Lukuo International Airport and 15 minutes from Nanjing Railway Station. With 5-star service and a touch of French romance, Sofitel Nanjing Galaxy Suning helps create memories that will last forever. Enjoy Champagne and a romantic gift in your elegantly styled room, and an indulgent breakfast in bed the next morning. Sofitel Nanjing Galaxy Suning lavishes guests with a full range of 5-star hotel services and leisure facilities to make the most of their stay. Explore the city with expert help of the concierge. Unwind at the hotels tennis court swimming pool spa or gym. Discover neraby Xuanwu Lake and Lion Bridge Gourmet Street. Explore the Xiaoling Mausoleum and City Wall of Ming Dynasty. Let us arrange a magnifique journey for you before you arrive. Ancient capital for six dynasties. Enjoy the utmost in style and comfort when you choose the limousine service at Sofitel Nanjing Galaxy Suning and travel in a luxury Mercedes Benz. Our dedicated concierge can make the arrangements for you, with every last detail planned to perfection. Illuminated by natural daylight, our large swimming area features two pristine pools - one for adults and another just for the little ones. Relax and take pleasure in the tempting array of pool-side refreshments, compliments of the hotel. 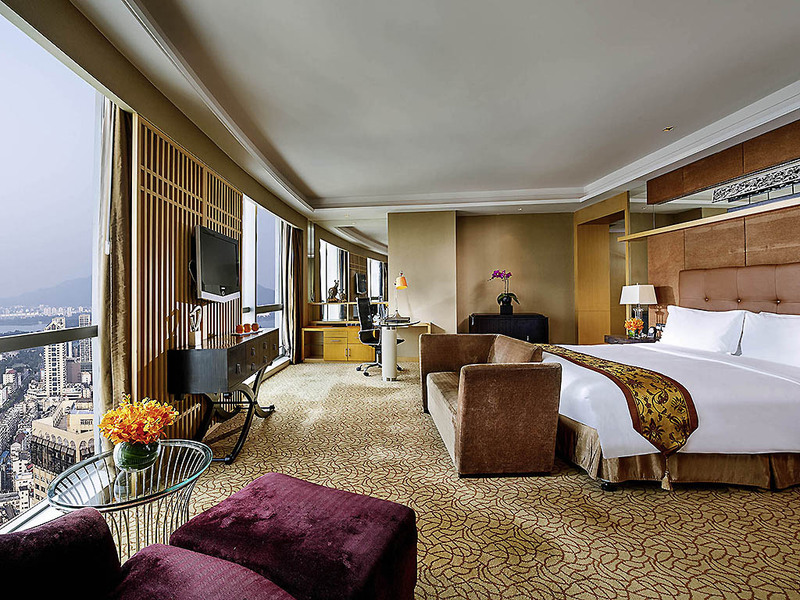 Sofitel Nanjing Galaxy Suning lavishes guests with a full range of 5-star hotel services and leisure facilities to make the most of their stay. Explore the city with expert help of the concierge. Unwind at the hotels tennis court,swimming pool or gym.